35,000 points Earn 35,000 Membership Rewards® Points after you spend $2,000 on eligible purchases with your new Card within the first 3 months. 4x Earn 4X Membership Rewards® points at U.S. restaurants. 4x Earn 4X Membership Rewards® points at U.S. supermarkets (on up to $25,000 per year in purchases, then 1X). 3x Earn 3X Membership Rewards® points on flights booked directly with airlines or on amextravel.com. 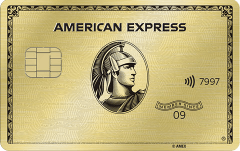 Our take: The American Express Gold Card is very rewarding for travel, restaurant and supermarket purchases, and comes with a bevy of luxury travel and dining perks to boot.